Two Solitaire card games in one pack: Spider and Klondike. In Spider, the aim is to stack cards in full suits so they are cleared from the game. 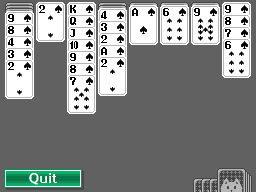 Any top card can be moved, however sequences of cards in a suit can be moved together. When no plays can be made, more cards are dealt. In Klondike, the aim is to place all 52 cards into the Foundations, built up by suit from Ace to King. Until cards can be moved to the Foundations, they must be stacked from high to low in alternating colors. Whole or partial stacks can be moved freely around the table.